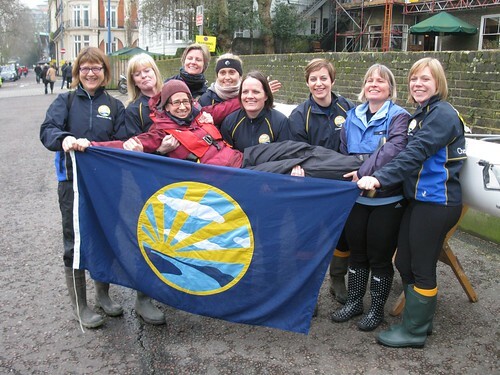 The Women’s Head of the River Race is, for many of us, the highlight of the rowing year. 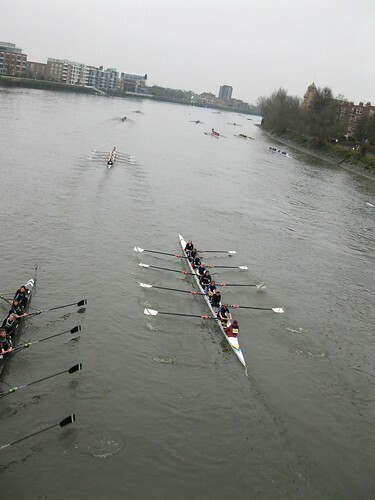 Although less immediately dramatic than the Bumps, it offers a much greater challenge: 20+ minutes of full-on racing on the Thames, against opposition from all corners of the UK and beyond. Just knowing that you’re taking part in a race alongside Olympians and along the same stretch of river as the Boat Race is pretty exciting! This year, despite a terrible forecast, we were blessed with ideal conditions: no rain and best of all little wind. The crew were well-prepared, having made the best of limited water time together by committing to a programme of long and gruelling ergs which really paid off in terms of fitness over the long course. We boated from Putney, right on the finish, which meant a good warm-up along the full length of the course and a chance to spot the landmarks that we would use later on to break the race into chunks. There followed about an hour of marshalling, tapping the boat in pairs to keep in position before we finally edged towards the start and spun. The race was on! It was my first time coxing on the Thames, and although I’d watched the helpful ‘Coxing the Tideway’ video (on youtube) several times, coxing on such a wide river with such a strong stream has to be experienced before you can really understand how different it is from the humble Cam. We got off to a good start, with our stroke Lorraine establishing a great rhythm and the rest of the crew backing her up and really committing to every stroke. Not such a great start for me, however, as I found myself too far over to the Middlesex side with an unexpected buoy looming and a marshal looking the other way from his boat just in front of it! Fortunately he saw us just in time and moved out of the way, although I had no choice but to go the wrong side of the buoy. After that I found the stream again, and remembered the most important piece of advice from the video: the fastest stream is usually in the middle of the river, so there’s no point trying to cut the corners. Maybe I’m not the only cox used to the twisty Cam who found it hard to resist the impulse to take the inside of every bend! Anyway, as we approached Hammersmith we really settled into our stride, and found ourselves bearing down on a Caius College crew. The overtake was really satisfying, with us shooting out of Hammersmith ahead of them with clear water between us, and with our supporters really lifting us with their shouts from the bridge. The crew really had to dig deep during the last third of the race, with each landmark seeming to take ages to come. But here the long ergs paid off, giving us confidence that we had the strength and stamina to stay strong to the end. In our crew chat before the race Anne had urged everyone to give everything, so that no one got to the end thinking they could have worked a bit harder. I think I can safely say that that finish line didn’t come a moment too soon for any of us. We were so glad that we only had a short distance to row to get back to our landing point. We came 247th out of 303 with a time of 22:20, a really satisfying result given that our previous placing was 272nd, and that we were within a minute of some very much more experienced Cambridge crews. Many thanks also to our brilliant supporters and bank party: Emily, Janice, Mel, Simon, Dave, Abby, Nick and Freya.